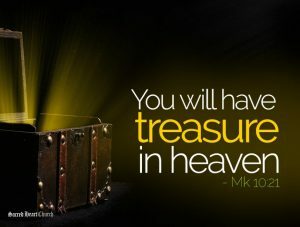 COMING CLOSER TO CHRIST: “What must I do to inherit eternal life?” The Rich Young Man’s struggle with possessions touches each one of us….how can I be spiritually detached from things and focused on what God wants from me. PARISH FINANCES: How is our parish using our finances? What are our expectations of parishioners/visitors to the church? We want to offer a beautiful space with uplifting liturgies so that you are nourished spiritually and bringing your faith to life. ACTION: Remember to talk to our staff in the office and sign up for automatic monthly donations. We recommend donating $100 per month. But whatever you are able to give, we thank you for your support of our parish community.